Iran is holding an international cartoon contest with the theme of US President Donald Trump and what is viewed as his racist and interventionist policies both at home and abroad. 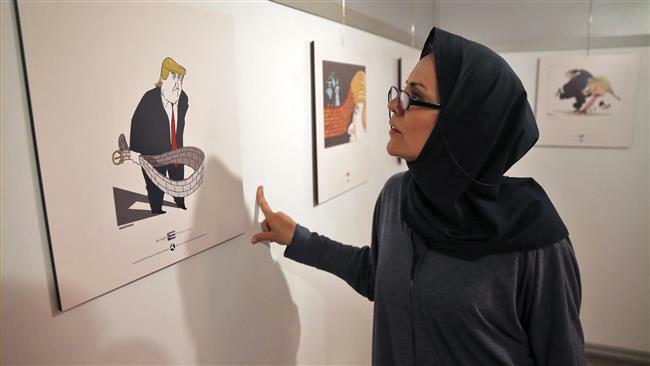 Over 550 people from 75 countries sent more than 1,600 artworks to the International Trumpism Cartoon and Caricature Contest in the exhibition that opened on Monday and will last one week. The logo for the competition is based on the Nazi emblem, depicting a diagonal “T” in a white circle against a red background. Iranian cartoonist Hadi Asadi won first place and was awarded $1,500. His drawing shows Trump wearing a jacket made of dollar notes while drooling on books as symbols of culture. Asadi said he wanted to highlight the “money-mindedness and warmonger nature” of the US president. Ali-Asghar Jafari, the competition’s director, said, the US has inflicted many wounds on Iran over the past years while it claims to advocate human rights. “Today, the US is moving against Muslim countries, especially Iran,” he said, adding, “It was difficult to prove US brutality in the past, but Trump’s presence has made it easy,” he added. “This contest considers Trump as a symbol of US capitalism and hegemony that many intellectuals compare with Nazism,” he added.